Rules in the United States tend to exist only within our borders. A person is quick to learn that things operate a little differently outside of America. This is a good thing—many find these different ways of doing things so appealing that they choose to frequently conduct business (thou shalt diversify, Jason Hartman encourages) and even move to another country. 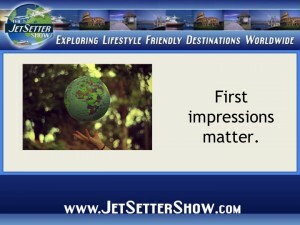 First impressions are lasting, especially in business. It is important to learn the customs of the country and people where you’ll be trying to fit in. Do they shake hands? Cheek kiss? Hug? Do some research to prepare for an initial greeting. Learn the word for hello in their native language, but…. First, use the formal title of the people you’re speaking to or meeting with. If someone suggests that you call them by first name, by all means do so—but approach the situation with formality initially. Next, remember that your pronunciation is likely off. It is appropriate to use a few words in a language you aren’t fluent in, but don’t overdo it. Consider hiring an interpreter if you suspect that a difference in language could lead to significant miscommunications. Similarly, remember to watch what your hands are doing. In other countries, your simple gestures may suggest something obscene or portray an attitude you do not intend. Do a little research before you hit the road and make sure that your body language and nonverbal communication says what you think it does. No matter the business, a well dressed person makes a greater impression than someone in cargo shorts and a faded polo. There is a place for business casual, but a first meeting is likely not one of them. If you wear typical business attire, you show respect to the people you’re meeting with. It is always better to be overdressed than under-dressed! While your American attitude toward time works well for business meetings with other Americans, it may not be the prominent attitude reflected abroad. Many countries are more lax about meeting times, letting the scheduled hour serve as more of a suggestion. Still, make sure that you are punctual—just don’t be offended if you’re left waiting for a bit.